This major scottish building by Schmidt Hammer Lassen is now open to students for the new term. We hope to bring more details and images soon. The building process of the University of Aberdeen New Library in Scotland is well underway as the topping-out ceremony just took place. The 15,500 m² landmark is expected to open to the public in 2011. The University of Aberdeen, established in 1495, is the fifth oldest English-language university in the world. In 2005, schmidt hammer lassen architects won the international competition to design the new university library which is to replace the existing Queen Mother Library. The new library will reinforce the reputation of the University as an important academic institution, as a place of research, learning and teaching. The 15,500 square metres of floor-space will host over a quarter of a million books, maps and manuscripts, as well as 1,200 reader spaces in a variety of environments, where cutting edge technologies are available. Additionally, Special Libraries and Archives offer historical collections in connection to a secure rare books reading room. The new library will be run by approximately 60 staff and serve a community of over 16,000 students. “University of Aberdeen New Library will be an exciting embodiment of the library of the future: open, multi-functional and accessible. It will be both a meeting place and a cultural centre for the University and the wider Aberdeen community; offering public spaces, exhibitions and events,” explains Morten Schmidt, Founding Partner at schmidt hammer lassen architects. The sweeping contours and organic form of the vast spiralling volume of the atrium, connecting the eight storeys, contrast with the clean cut exterior profile of the library. The glazed façade enables the library to appear shimmering during the day and to glow in the night. Presently, half of the glass façades have been mounted; the remaining part will be mounted in the coming weeks. “University of Aberdeen New Library will be certified BREEAM Excellent which proves that the building is designed to minimise long term running costs and energy use. For instance rainwater harvesting for use in the WC flushing and photo voltaic cells on the roof of the library will be incorporated, as will the integrated hybrid ventilation and a series of intelligent management systems to optimise the energy strategy. 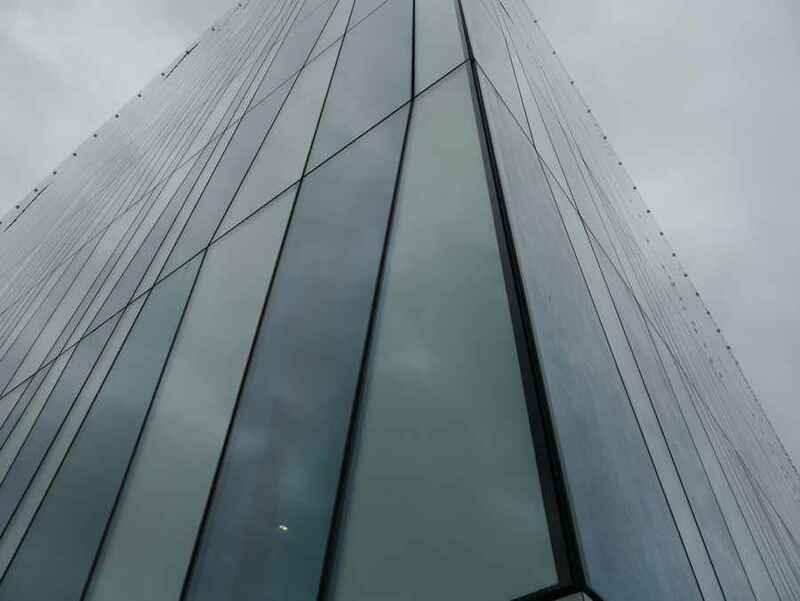 Moreover, the extensive glazing of the library provides high insulation standards and plenty of daylight combined with that from the central atrium,” Stephen D. Willacy, Partner at schmidt hammer lassen architects clarifies. He stresses that sustainability is integral to the holistic design process of schmidt hammer lassen architects. schmidt hammer lassen architects works with libraries across all scales from branch libraries and central libraries to university libraries. The practice is renowned for the extension of The Royal Library in Copenhagen, Denmark, and has also designed Halmstad Library and the extension of Växjö Library in Sweden. Ongoing library projects include Urban Mediaspace, Scandinavia’s biggest public library, in Aarhus, Denmark and two medium-size libraries in Halifax and Edmonton, Canada. With 24 years of experience, schmidt hammer lassen architects is one of Scandinavia’s most recognised, award-winning architectural practices and has a long track-record of designing educational and learning facilities. In London, the practice has designed City of Westminster College which will have practical completion in November 2010 and open in the beginning of 2011. 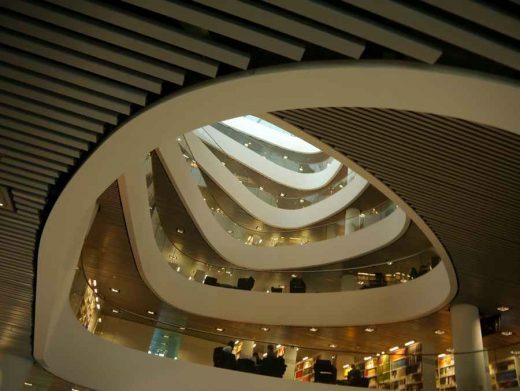 The University of Aberdeen has embarked on a major flagship library project worth £55.5M ($96.4M) which will consolidate the institution’s position as a leader among world universities. The Aberdeen University Library project is one of the largest-ever fundraising campaigns to be undertaken by a UK university for a new library. The ‘Library for our Sixth Century’ will spearhead the next phase of the University’s 10-year investment in its £228M capital development programme, which is integral to the academic ambition of the institution. The Aberdeen University Library project, designed by the leading Danish architectural practice schmidt hammer lassen, will provide facilities for our 13,900 student community, replacing the existing Queen Mother Library which was built when the university had only 5,000 students on campus. The new building will also house historic collections of Aberdeen University comprising more than 200,000 rare books and over 4,000 archive collections. Professor C Duncan Rice, Principal and Vice-Chancellor, said of the project: “For 500 years the library has been at the heart of the University of Aberdeen. There has never been a more intellectually exciting time to be part of Aberdeen University. Over recent years, we have attracted more than 50 internationally distinguished, senior academics and many more junior ones of equal potential. They are joining an intellectual community which is already extremely strong. Our competitively won research income has increased tenfold in the last decade. We are entering our Sixth Century of achievement as a leader in international learning, innovation and discovery. “As we look ahead to the challenges and opportunities of the 21st Century, the library project is part of the vision to match the quality of our people and the richness of our history and heritage with an outstanding intellectual and cultural facility, the benefits of which will stretch far beyond our University community. The new Aberdeen University library will be located adjacent to the existing Queen Mother Library on the King’s campus. The QML will be demolished on completion of the new facility and the new library is expected to be open by 2010. Securing investment from funding bodies and individual donors worldwide will be an integral part of taking the development forward. This will continue a tradition of philanthropic support which has made the University what we are today. The Danish architectural practice schmidt hammer lassen has an impressive portfolio of outstanding cultural and civic buildings, including the much-acclaimed Royal Library in Copenhagen. The team was selected for the Aberdeen project following an international competition which challenged architects across the world to create a library design for the 21st century and beyond. The Aberdeen University Library competition attracted almost 100 expressions of interest, 40 full submissions and a shortlist of six. Members of the SHL team have presented to internal audiences over the last couple of weeks, as part of a series of meetings with our internal communities, including our governors. In addition, the team made its first external presentation to members of Aberdeen City Council in late May and we will consult on a regular basis with the local community. 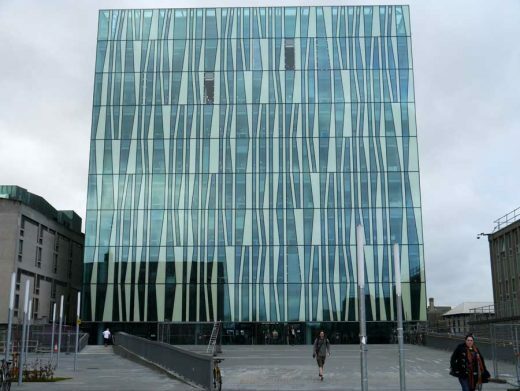 The new library is not for Aberdeen University alone. It will be an inviting building for our local community and everyone who lives and works in the North-east. The ground floor will be a spacious, light, airy and welcoming public plaza, below a spiralling atrium with a café, regular exhibitions and events, and other attractions for the whole community. A public meeting is being held this evening (June 7) to communicate more information about this exciting new development for the whole area. It will be an opportunity to meet the architects and the Aberdeen University project team and most importantly to hear ideas about how the local community might want to use the new library building. Professor Christopher Gane, Vice-Principal, Library and Information Services, who is leading the University project team, believes the benefits of this major initiative will extend well beyond the Aberdeen University campus. He explained: “We are delighted to be working with schmidt hammer lassen as our partners in this ambitious and exciting project. Their approach is an excellent match for our own aspirations to provide the very best library facilities for students, staff, and researchers, reflecting modern study requirements and adding the value of new technology and electronic resources to our magnificent collection of books and other rare material. Morten Schmidt, Principal Project Partner with Aarhus-based schmidt hammer lassen, expressed the enthusiasm of his team for the Aberdeen University Library project and said: “We are absolutely delighted to have been appointed to undertake this prestigious project for the University of Aberdeen. It is a great honour to win such an international architectural competition. We are aware of the library’s importance, not just for the University itself but also for the local community and the Scottish nation. A final design of the new library building is expected in early autumn this year. In its historic collections, the University of Aberdeen safeguards over a quarter of a million books and manuscripts, collected over five centuries from the foundations of the University in 1495. The exceptionally rich collection of Hebrew literature featured in media coverage last week at a joint event with the Aberdeen Hebrew Congregation to celebrate the Festival of Purim, with a scroll of the text of the Book of Esther as centrepiece for the event. The £16 million Matthew Hay project, a partnership with NHS Grampian to create an outstanding purpose-built facility on the Foresterhill health campus for medical education and the ongoing development of 21st century skills for all members of the healthcare team. A total of £12 million has been committed by the two partner organisations, with an energetic fundraising appeal to raise a further £4 million being led by Professor Sir Graeme Catto. Edinburgh architects Bennetts Associates are now working on a design for the building, which is due to open in September 2008. The £23 million Aberdeen Regional Sports Facility, a sporting centre on the site of the Chris Anderson Stadium at Linksfield which will be a partnership between the University of Aberdeen, Aberdeen City Council, and sportscotland, and which received outline planning approval last week. The University and City Council are each contributing £8 million towards the first phase of this ambitious project, and are working with sportscotland to secure an additional £7million. This new community sports development, aimed at nurturing local talent as well as building a fitter community, will provide a full-size indoor football pitch as well as facilities for athletics and hockey. In addition, there will be a multi-sport games hall, squash courts, and fitness suites. For media interviews on the University’s new flagship library with Professor Christopher Gane, Vice-Principal, Library and Information Services, please contact Angela Ferguson, University of Aberdeen, on: +44 (1224) 272960 or for interviews with Morten Schmidt, Principal Project Partner with Aarhus-based schmidt hammer lassen, please contact schmidt hammer lassen, on: +45 87 32 53 04. Issued by the Communications Team, Office of External Affairs, University of Aberdeen, King’s College, Aberdeen.